Christmas in many small towns are a special time for all ages and Jefferson Texas is no different. When you come to Jefferson you’ll find quite a few family fun things to do. Christmas plays are always a huge hit. There’s something about sitting in a theater experiencing a live performance that brings a smile to your face that’s hard erase. 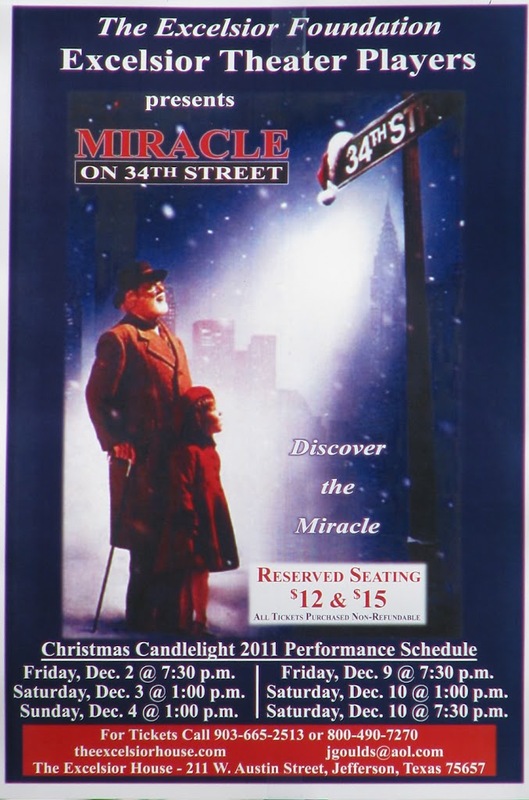 This year’s play is the classic the Miracle on 34th Street. Friday 12/2/11 at 7:30 PM, Saturday 12/3/11 at 1 PM and Sunday 12/4/11 at 1 PM. Friday 12/9/11 at 7:30 PM, Saturday 12/10/11 at 1 PM and 7:30 PM. For more information visit one of Jefferson Texas’ Oldest Hotels site featuring the Excelsior Theater Players. Don’t miss this or any of the fun old fashion activities during this special time of year, book your Jefferson Texas Hotel room today.